Hiya guys! Today I'll be sharing swatches for the newly released September Magic 8 Box. For the month of September, the box embraces the theme 'Greetings From Around the World'! In this box we have the four permanent makers: Philly Loves Lacquer, Smokey Mountain Lacquers, Rica, and My Indie Polish. 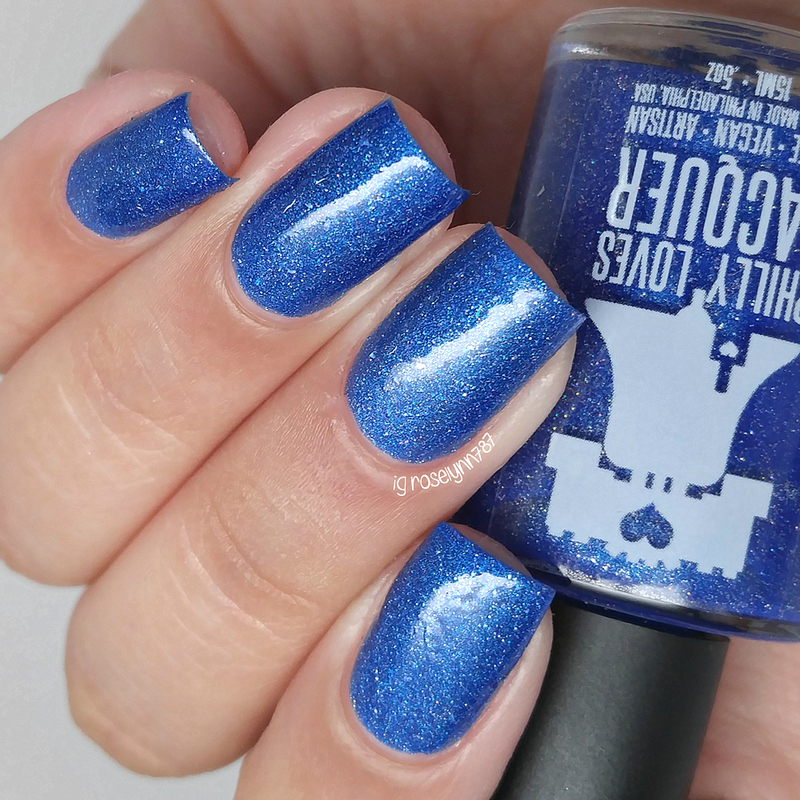 This month our guest makers include: Lollipop Posse Lacquer, Drip Drop Nail Paint, Scofflaw Nail Varnish, and Doctor Lacquer. With so many fabulous makers and a limited amount of boxes left, we have no time to waste so let's get to the swatches. 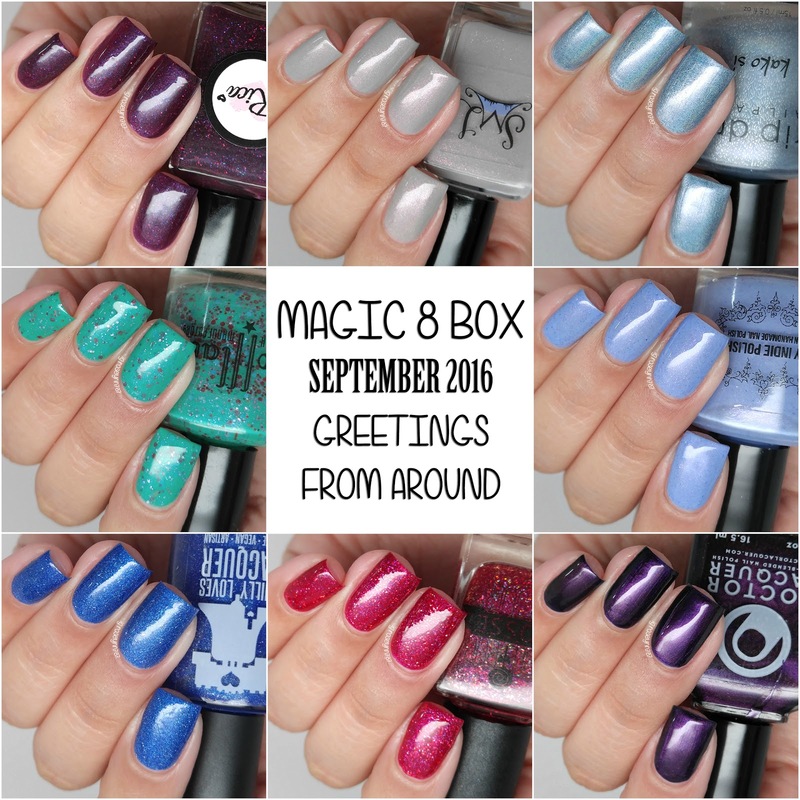 The September Magic 8 Box is now available for purchase through www.phillyloveslacquer.com. Each box retails for $59 plus shipping. There's a cap of 50 boxes and once it's sold out it will be gone for good. Don't miss out on your chance to own these exclusive LE polishes! Shalom Aleichem by Philly Loves Lacquer sending greetings from Israel. 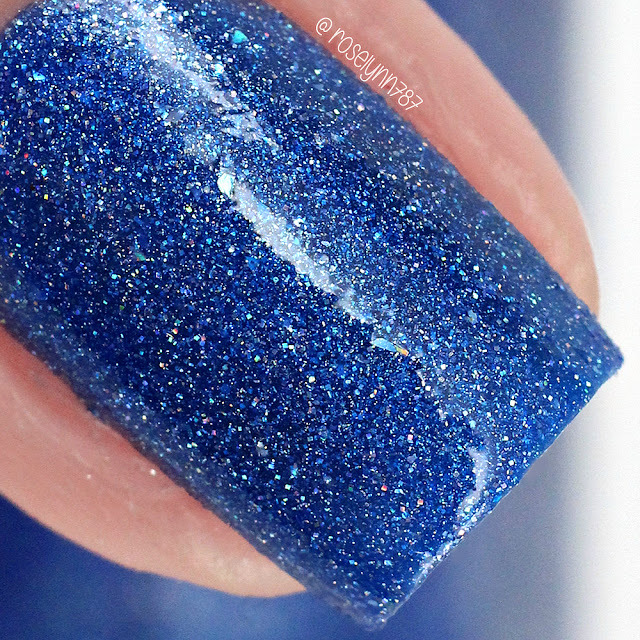 It can be described as a bright blue crelly with silver holographic micro flakes, holographic micro glitter, and a dusting of holo sparkle. The formula has a great consistency, not too thick or too thin, and applies really easily. This does end up drying to a gritty finish and will need at least one layer of topcoat to smooth down the glitters. Shown here in two coats plus two layers of topcoat. ﻿Bonjour by Smokey Mountain Lacquer sending greetings from France. It can be described as a grey crelly with slight taupe undertones with gold shimmer and pink/red/orange iridescent micro flakes. My photos don't do this beauty any justice, it has such a gorgeous pink reflective shimmer in person. 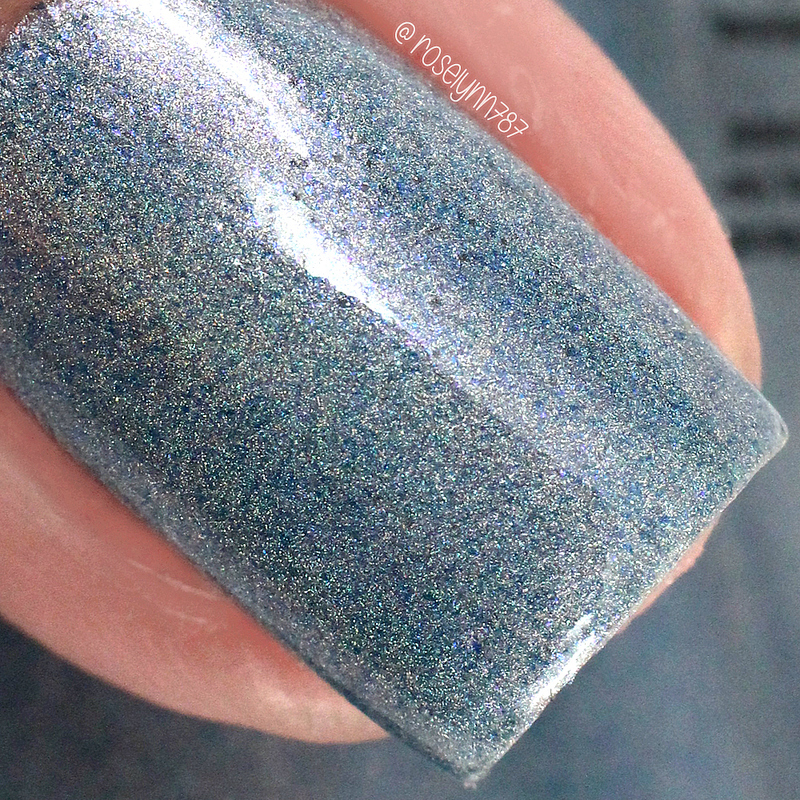 The formula was a bit on the thick side, but was manageable enough to layer for an opaque finish. Shown here in two coats and sealed off with a glossy topcoat. ﻿Bom Dia by My Indie Polish sending greetings from Portugal. It can be described as ﻿a hydrangea blue/periwinkle crelly with metallic blue micro glitter, purple micro flakes, silver micro flakes, pink shimmer, and blue/purple iridescent micro flakies. One of my favorite things about this polish is the tone of the shade. It's not a very common one in my collection and the glitter flakie combo really suits it well. The formula has such a dreamy application, it glides on and has perfect self-leveling. Shown here in two coats and sealed off with a glossy topcoat. ﻿Privet by Rica sending greetings from Russia. 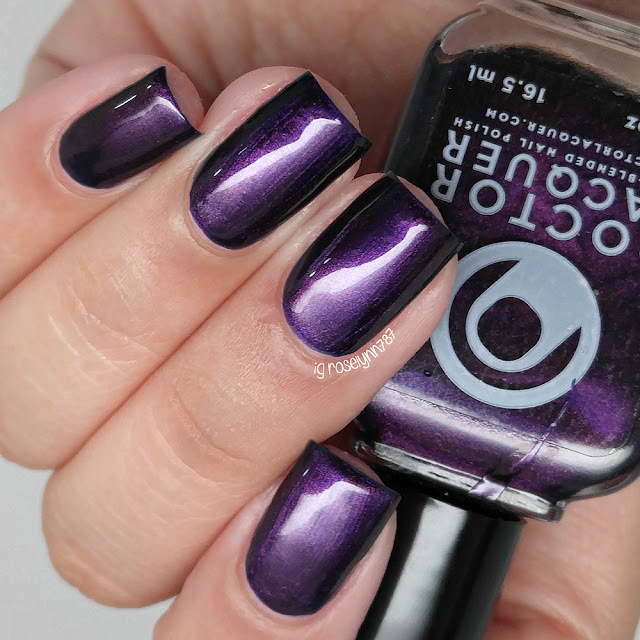 It can be described as ﻿a blackberry purple jelly with a slight blue shimmer, as well as blue, violet, and maroon holo and metallic micro glitter, and a holographic shimmer. Shown here in three coats and sealed off with a glossy topcoat. ﻿Konnichiwa by Lollipop Posse Lacquer sending greetings from Japan. 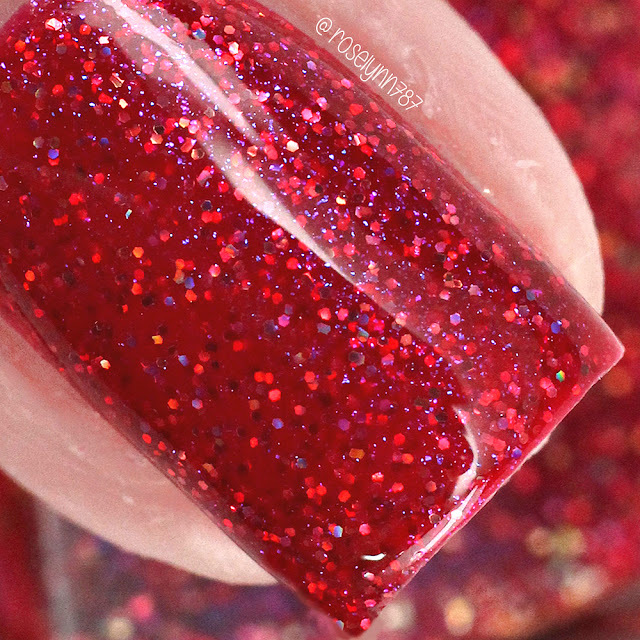 It can be described as an apple red jelly with blue/purple iridescent micro flakes and red holo micro glitter. 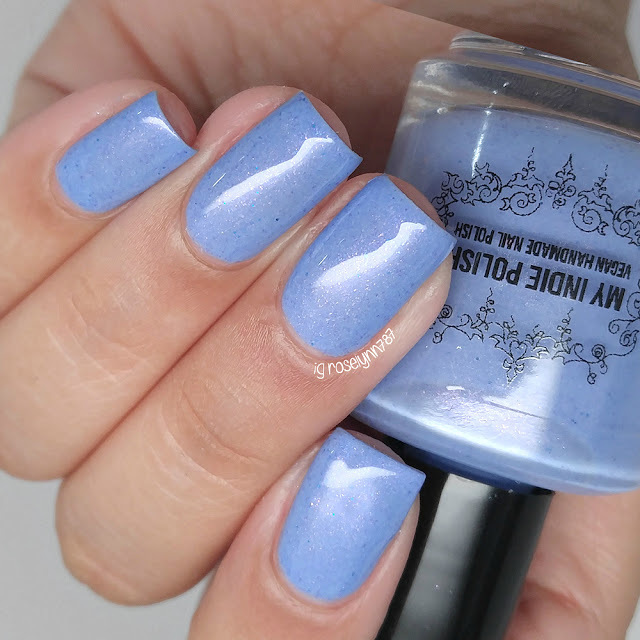 It has been a while since I have worn a polish from this indie brand and holy moly I have been missing out. I could honestly not stop staring at my nails in awe as I wore this. Really my photos do no justice to how incredible the sparkle is in person. The formula was fantastic, much more opaque than I had anticipated. Shown here in two coats and sealed off with a glossy topcoat. ﻿Kako Si by Drip Drop Nail Paint sending greetings from Croatia. 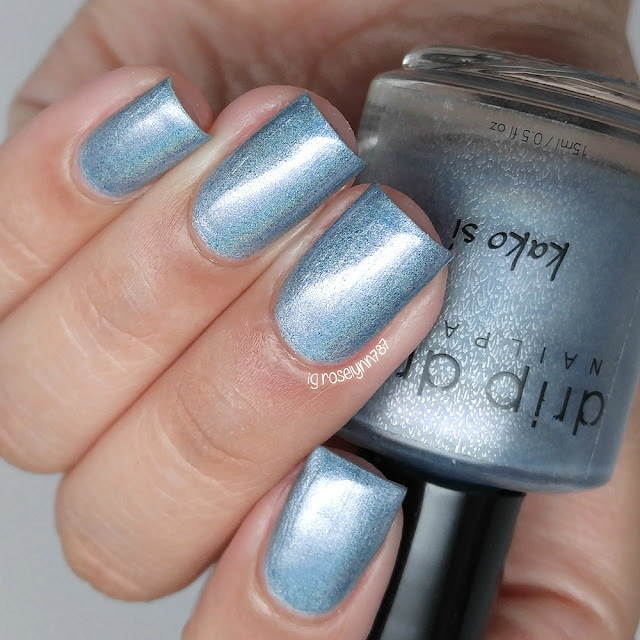 It can be described as a metallic ice blue polish filled with linear holo pigment and blue micro glitter. I feel like this one was the star of this box, which says a lot because there was nothing about this box that I didn't love. The formula has such a smooth and easy application, the brush strokes level out as it dries. It's also very opaque and I honestly could have got away with two coats had I used slightly thicker coats during the application. Shown here in three coats and sealed off with a glossy topcoat. ﻿Kveðjur by Scofflaw Nail Varnish sending greetings from Iceland. It can be described as a pastel teal crelly with lavender, maroon, turquoise, and purple matte glitter in various sizes and a dusting of shimmer. From this months box, this was the only new to me brand and I was so excited to try it out. The shade to glitter combination is so unique. Shown here in two coats and sealed off with a glossy topcoat. ﻿Salaam Alaikum by Doctor Lacquer sending greetings from Morocco. 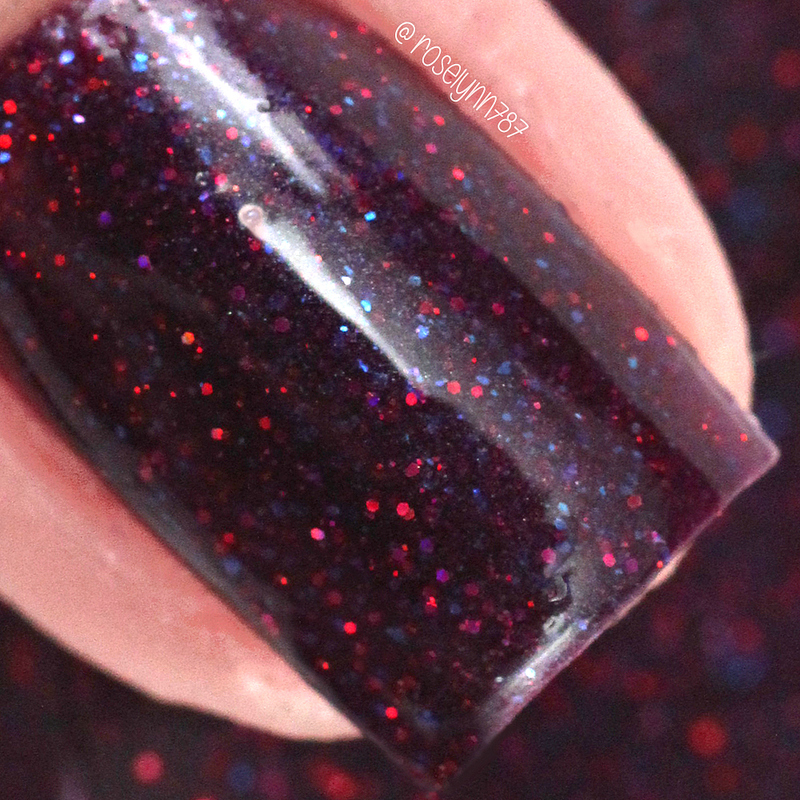 It can be described as a deep purple jelly with blue undertones filled with a shimmery red/orange shift. 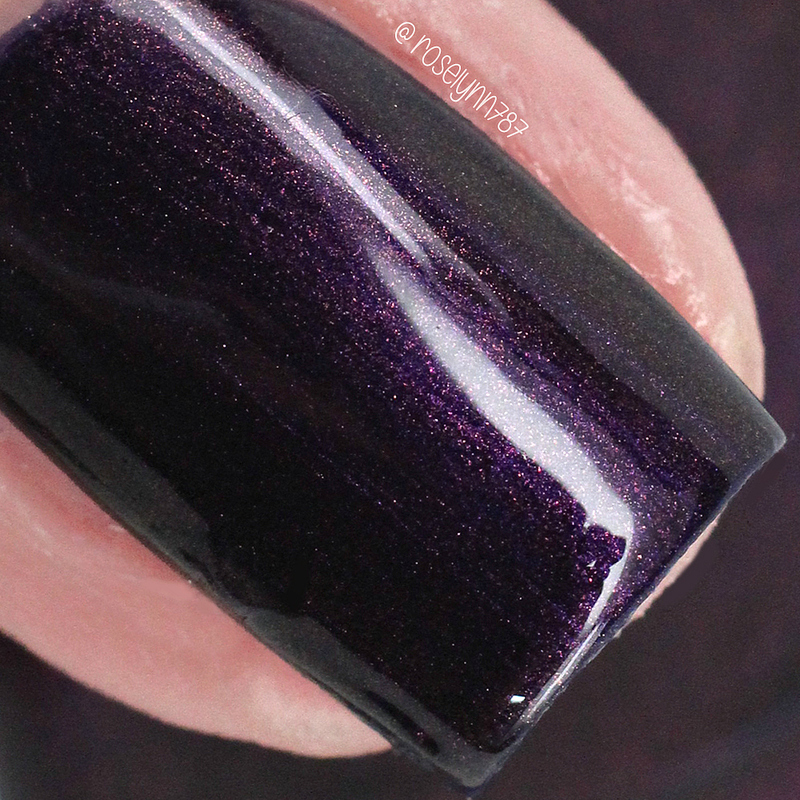 The formula has very opaque coats, but the consistency felt a little bit on the thick side. It wasn't unmanageable during the application process, but it tended to pull while layering. Shown here in two coats and sealed off with a glossy topcoat. Overall this is such a fun and interesting box theme with gorgeous shades to boot. One of the main things I love about a box is variety, so I felt some type of way when I saw two purples. But that quickly disappeared after wearing each one and seeing how different each one looked on me. I don't usually say this lightly (especially not for a box this large in size), but I do feel as if the entire box is a must-have. 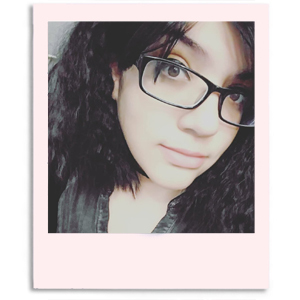 Even with the two that I experienced having slightly thicker formulas, I feel like a bit of thinner will take care of that easily next time I use them. Let me know what you guys think of this months box. Will you be nabbing this as a whole or maybe seeking out one or two? To recap, each box retails for $59 plus shipping. There's a cap of 50 boxes and once it's sold out it will be gone for good. Don't miss out on your chance to own these exclusive LE polishes! 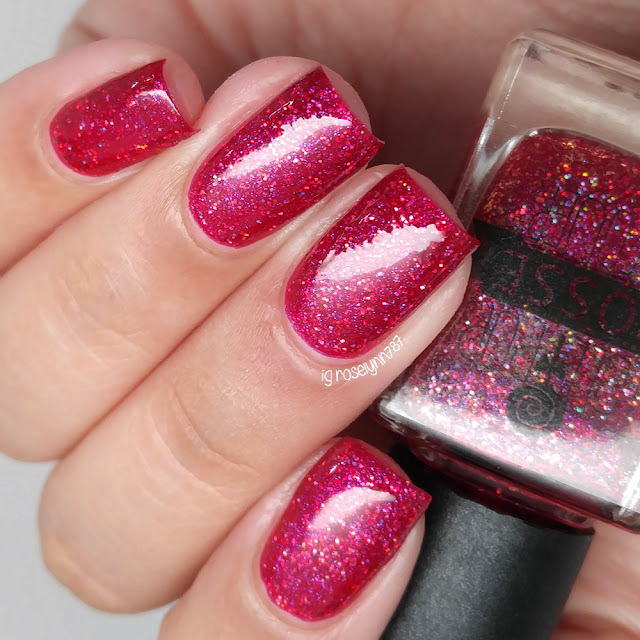 This box looks like so much fun, I love Bonjour from Smokey Mountain, pink shimmer over gray is a great combo! I'm loving the theme of this box! This is really a great box! 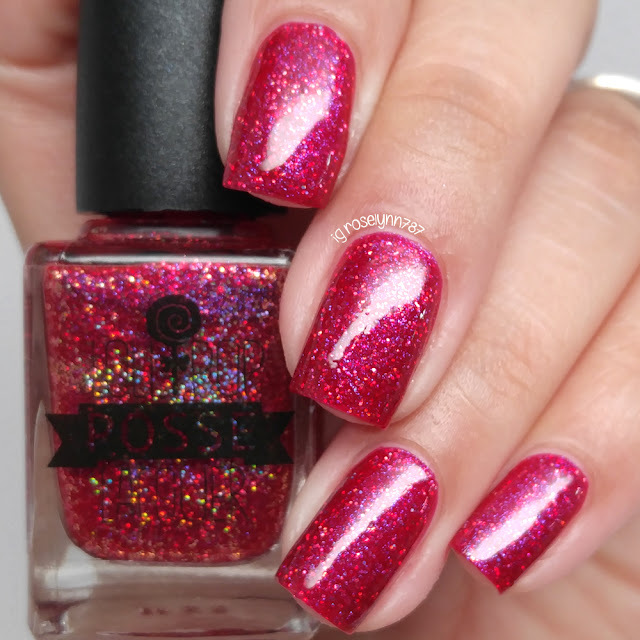 Every one of the polishes look amazing!